The 2018 corn for grain crop is estimated at 156.00 million bushels, 16 percent below last year's production of 185.90 million bushels, according to the December 1 Agricultural Survey conducted by the Mountain Regional Field Office of the National Agricultural Statistics Service, USDA. The average yield of 130.0 bushels per acre is 13.0 bushels per acre below the yield realized last year. Area harvested for grain in 2018, at 1.20 million acres, is 100,000 acres below last year. Acreage cut for corn silage is estimated at 190,000 acres, up 60,000 acres from last year, with production estimated at 4.18 million tons, compared with 3.32 million tons produced last year. Sorghum for grain production is estimated at 17.23 million bushels, down 8 percent from the previous year. Average yield is estimated at 53.0 bushels per acre, up 1.0 bushel per acre from last year. Producers harvested 325,000 acres for grain, down 35,000 acres from last year's area harvested. Acreage cut for sorghum silage is estimated at 8,000 acres, down 17,000 acres from last year, with production estimated at 112,000 tons compared with 375,000 tons produced last year. Oat seedings in Colorado totaled 95,000 acres, up 45,000 acres from last year, and the highest since 100,000 acres were seeded in 2003. Producers harvested 7,000 acres for grain or seed, down 2,000 acres from 2017. Oat production totaled a record low 350,000 bushels in 2018, down 40 percent from last year and 50,000 bushels below the previous record low production in 2002. Oat yield is 50.0 bushels per acre in 2018, down 15.0 bushels per acre from the previous year, and the lowest yield since 50.0 bushels per acre in 2002. Colorado's barley seeded area, at 58,000 acres, is down 12,000 acres from last year. Harvested area, at 52,000 acres, is down 16,000 acres from 2017. Barley yield, at 145.0 bushels per acre is a record high, up 13.0 bushels per acre from last year and 10.0 bushels per acre above the previous record in 2009. Barley production in 2018 is estimated at 7.54 million bushels, down 16 percent from the previous year. All wheat production in Colorado, estimated at 70.50 million bushels, is down 20 percent from 2017. 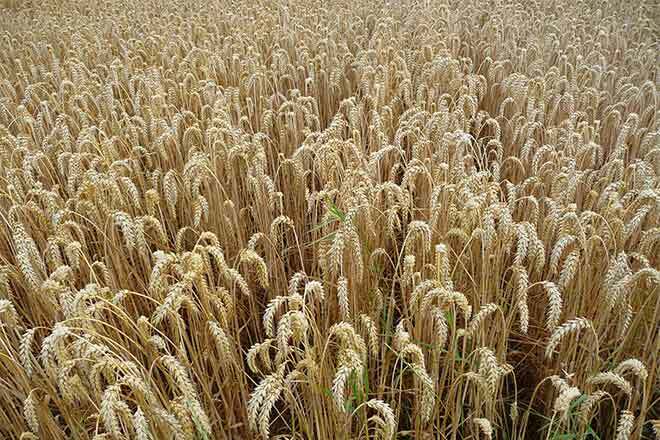 All wheat yield was 36.1 bushels per acre, down 7.1 bushels per acre from a year ago. Winter wheat producers seeded 2.25 million acres in the fall of 2017 for harvest in 2018, unchanged from the acres seeded for the previous year's crop. Acreage harvested for grain decreased 70,000 acres from last year to 1.95 million acres in 2018. Winter wheat production is estimated at 70.20 million bushels, down 19 percent from last year. Winter wheat yield, at 36.0 bushels per acre, is down 7.0 bushels per acre from last year. Spring wheat seedings, at 10,000 acres, are unchanged from last year. Acreage harvested totaled a record low 4,000 acres, down from 9,000 acres harvested last year. Spring wheat production is estimated at a record low 304,000 bushels, down 59 percent from last year. The previous record low production was 340,000 bushels in 1968. Spring wheat yield, at 76.0 bushels per acre, is down 6.0 bushels per acre from last year. 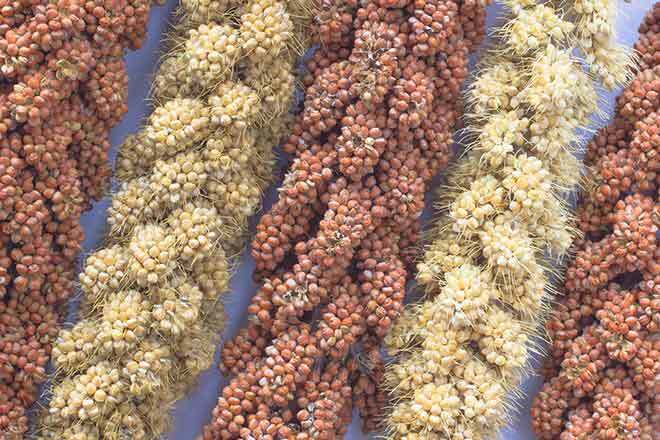 Proso millet production in the state is estimated at 7.70 million bushels, down from 11.17 million bushels produced last year. Farmers harvested 275,000 acres of proso millet, down 15,000 acres from the previous year. Yield decreased 10.5 bushels per acre from last year to 28.0 bushels per acre. All hay production for 2018 is estimated at 3.62 million tons, down 9 percent from the 2017 total. Alfalfa hay production is estimated at 2.48 million tons from 730,000 acres harvested, down 182,000 tons from 2017. Average yield for the 2018 crop is 3.40 tons per acre, 0.30 ton per acre below last year. All other hay production totaled 1.14 million tons from 690,000 acres harvested, down 157,000 tons from 2017. The average yield of 1.65 tons per acre is 0.15 ton per acre below last year. New seedings of alfalfa and alfalfa mixtures in Colorado are estimated at 85,000 acres, up 21 percent from 2017. As of December 1, producers in Colorado were storing 1.75 million tons of all hay, unchanged from last year. All sunflower production is estimated at 61.95 million pounds from 56,000 acres harvested. Yield is estimated at 1,106 pounds per acre, up from the 1,026 pounds attained last year. Production of oil varieties decreased 26 percent from the previous year to 53.90 million pounds and production of non-oil varieties decreased 39 percent from the previous year to 8.05 million pounds. The state's sugarbeet crop of 831,000 tons for 2018 is down 20 percent from the 1.04 million tons produced in 2017. Producers harvested 25,500 acres in 2018, down from 29,000 acres in 2017. Average yield is estimated at 32.6 tons per acre, 3.1 tons per acre below 2017. Colorado potato growers produced an estimated 21.72 million hundredweight of potatoes this year, up 2 percent from last year's crop. Fall potatoes produced in the San Luis Valley totaled 20.12 million hundredweight compared with 19.31 million hundredweight produced last year. Fall potatoes grown in all other areas in Colorado totaled 1.60 million hundredweight compared with 1.91 million hundredweight last year. Average yield, at 395 hundredweight per acre, increased 13 hundredweight per acre from the combined yield attained last year. The harvested area, estimated at 55,000 acres is down from the 55,600 acres harvested last year. Dry edible bean production is set at 668,000 million hundredweight, 39 percent below the 2017 crop of 1.09 million hundredweight. Average yield is estimated at 2,120 pounds per acre, 120 pounds per acre above last year. Harvested area, at 31,500 acres, is 23,000 acres less than last year. Winter wheat seedings last fall for the 2019 crop year are estimated at 2.25 million acres, unchanged from last year. Corn for grain production in 2018 was estimated at 14.4 billion bushels, down 1 percent from the 2017 estimate. 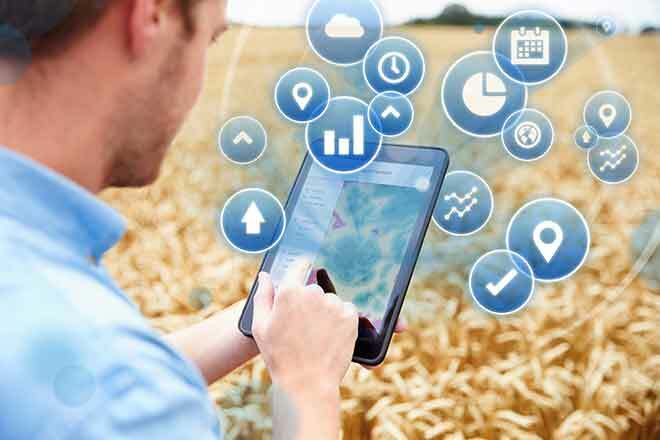 The average yield in the United States was estimated at 176.4 bushels per acre, 0.2 bushel below the 2017 record yield of 176.6 bushels per acre. Area harvested for grain was estimated at 81.7 million acres, down 1 percent from the 2017 estimate. Corn silage production was estimated at 121 million tons for 2018, down 5 percent from 2017. The United States silage yield was estimated at 19.9 tons per acre, down 0.1 ton from 2017. Area harvested for silage was estimated at 6.11 million acres, down 4 percent from a year ago. Sorghum grain production in 2018 was estimated at 365 million bushels, up 1 percent from the 2017 total. Planted area for 2018 was estimated at 5.69 million acres, up 1 percent from the previous year. Area harvested for grain, at 5.06 million acres, was up less than 1 percent from 2017. Grain yield was estimated at 72.1 bushels per acre, up 0.4 bushel from 2017. Sorghum silage production was estimated at 3.33 million tons, down 12 percent from 2017. Area harvested for silage was estimated at 264,000 acres, down 6 percent from the previous year. Silage yield averaged 12.6 tons per acre, down 0.8 ton per acre from 2017. Oat production in 2018 was estimated at 56.1 million bushels, up 13 percent from 2017. Yield was estimated at 64.9 bushels per acre, up 3.2 bushels from the previous year. Harvested area, at 865,000 acres, was 8 percent above the previous year. Barley production was estimated at 153 million bushels, up 8 percent from the 2017 total of 142 million bushels. Average yield, at 77.4 bushels per acre, was up 4.4 bushels from the previous year. Producers seeded 2.54 million acres in 2018, up 2 percent from 2017. Harvested area, at 1.98 million acres, was up 1 percent from 2017. All wheat production totaled 1.88 billion bushels in 2018, up 8 percent from the 2017 total of 1.74 billion bushels. 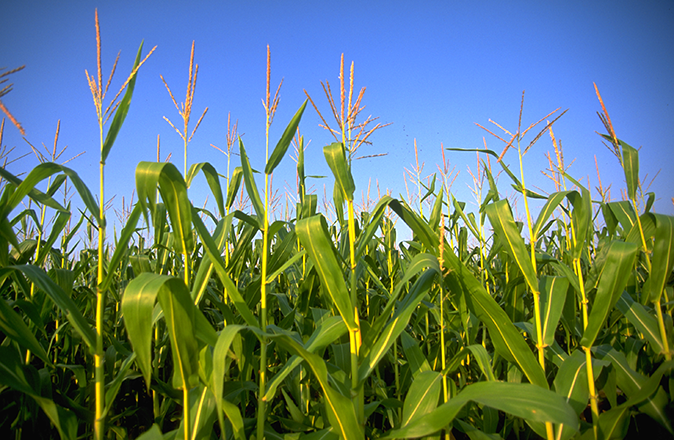 Area harvested for grain totaled 39.6 million acres, up 5 percent from the previous year. The United States yield was estimated at 47.6 bushels per acre, up 1.3 bushels from the previous year. Winter wheat production for 2018 totaled 1.18 billion bushels, down 7 percent from the 2017 total of 1.27 billion bushels. The United States yield, at 47.9 bushels per acre, was down 2.3 bushels from 2017. Area harvested for grain was estimated at a record low 24.7 million acres, down 2 percent from the previous year. Other spring wheat production for 2018 was estimated at 623 million bushels, up 50 percent from the 2017 total of 416 million bushels. Harvested area totaled 12.9 million acres, up 27 percent from 2017. The United States yield was estimated at a record high 48.3 bushels per acre, 7.3 bushels above 2017. Production of proso millet in 2018 totaled 12.0 million bushels, compared with the 14.9 million bushels produced in 2017. Area planted to proso millet in the United States was estimated at 443,000 acres, down 35,000 acres from 2017. Area harvested in the United States, at 403,000 acres, was unchanged from 2017. The average yield for 2017 was estimated at 29.8 bushels per acre, down 7.1 bushels from 2017. Production of all dry hay for 2018 was estimated at 124 million tons, down 4 percent from the revised 2017 total. Area harvested was estimated at 52.8 million acres, up less than one percent from 2017. The average yield, at 2.34 tons per acre, was down 0.09 ton from the previous year. Production of alfalfa and alfalfa mixtures in 2018 was estimated at 52.6 million tons, down 6 percent from the revised 2017 total. Harvested area, at 16.6 million acres, was 2 percent below the previous year. Average yield was estimated at 3.17 tons per acre, down 0.11 ton from 2017. Production of all other hay in 2018 totaled 71.0 million tons, down 2 percent from the revised 2017 total. Harvested area, at 36.2 million acres, was up 1 percent from the previous year. Average yield was estimated at 1.96 tons per acre, down 0.06 ton from 2017. Growers seeded 2.22 million acres of alfalfa and alfalfa mixtures during 2018, up less than 1 percent from 2017. The new seedings of alfalfa and alfalfa mixtures will normally be harvested for the first time in the year following planting. All hay stored on United States farms as of December 1, 2018 totaled 79.1 million tons, down 6 percent from the previous December. Disappearance from May 1, 2018 - December 1, 2018 totaled 59.9 million tons, compared with 68.2 million tons for the same period a year earlier. This marks the lowest December 1 hay stocks since the drought of 2012 and second lowest since 1977. The 2018 sunflower production totaled 2.12 billion pounds, down 1 percent from 2017. The United States average yield per acre of 1,731 pounds increased 128 pounds from 2017. The average yield was a record high for the United States. Planted area, at 1.30 million acres, was 7 percent below the previous year. Area harvested decreased 8 percent from 2017 to 1.22 million acres. United States production of oil-type sunflower varieties, at 1.90 billion pounds, increased 3 percent from 2017. Compared with the previous year, harvested acres were down 6 percent but the average yield increased by 144 pounds to 1,726 pounds per acre. Production of non-oil sunflower varieties was estimated at 220 million pounds, a decrease of 24 percent from 2017. Area harvested, at 123,500 acres, was down 25 percent from 2017, and was the lowest on record since 1975. The average yield increased by 31 pounds from 2017 to 1,781 pounds per acre and represented the second highest yield on record for non-oil varieties. Sugarbeet production for 2018 was estimated at 33.1 million tons, down 6 percent from the previous year's revised production. Growers in the 11 major sugarbeet-producing States planted 1.11 million acres, down 2 percent from the 2017 revised area. Harvested area, at 1.10 million acres, was down 2 percent from the previous year. Estimated yield, at 30.3 tons per acre, was down 1.4 tons from last year. Production of fall potatoes for 2018 was estimated at 420 million cwt, up 3 percent from the previous year. Area harvested, at 918,600 acres, was up slightly from 2017. The average yield was estimated at a record high 458 cwt per acre, up 13 cwt from the previous year. United States dry edible bean production was estimated at 37.5 million cwt for 2018, up 4 percent from the previous year. Planted area was estimated at 2.08 million acres, down 1 percent from 2017. Harvested area was estimated at 2.02 million acres, down fractionally from the previous year. The average United States yield was 1,860 pounds per acre, an increase of 82 pounds from 2017 and the third highest on record. Winter wheat planted area for harvest in 2019 is estimated at 31.3 million acres, down 4 percent from 2018 and down 4 percent from 2017. This represents the second lowest United States acreage on record.